So I own a pair of KEF Q500 with Cambridge CXA60. Really killer combo IMO. As I was planning to change the caps to better ones, so I checked online, and everyone is saying that crossover is terrible design. I tried to find all the content on the internet, but I only find two specifically with Q500. Changing the inductors. And this is the part where I'm stuck. What gauge should I use? And what wire? I was checking the Jentzen air cores. Could anyone help me with this? Is there anyone who already did something similar? everyone is saying that crossover is terrible design. If the crossover is terrible design, than do not "upgrade" it with crazy expensive components (with the same values). You will end up with crazy expensive terrible crossover. Are you sure the crossover is terrible in design? Any measurements? When replacing inductors you should take care to match the DCR of the originals. Don't go willy-nilly lowering them. For shunt caps, some crossovers can be extra sensitive. 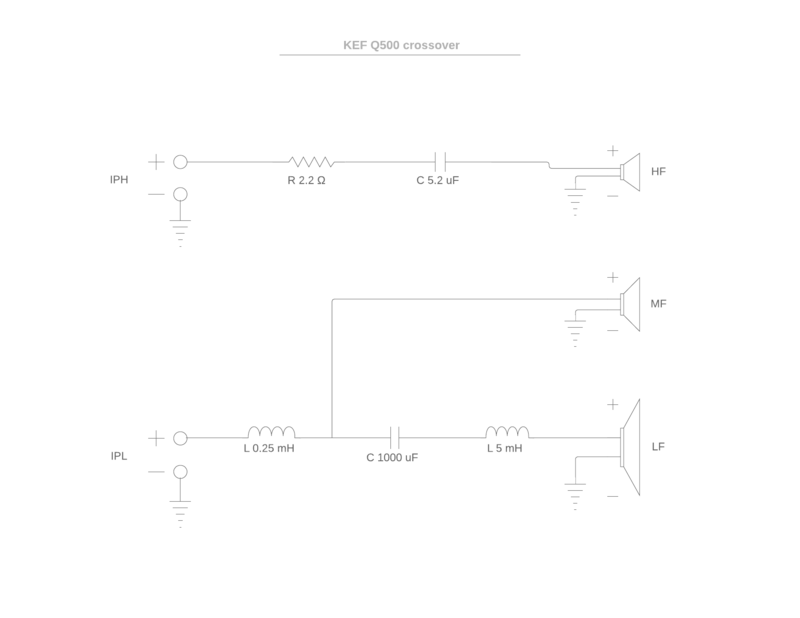 Measure ESR and compensate by altering any series resistors. But yes, the best approach is to analyze the crossover itself first. Make sure you want to replace those parts to begin with, or whether you find opportunities for improvement. Don't change inductors. Caps and resistors are OK, although you might not hear any difference at all. And if you do hear a difference, is it better than the stock crossover? I'm not sure in the design, this is the first time when I'm actually trying to understand any crossover. As I said, this is what people say. but I got your point. It's better to leave it as is if you don't know what you are doing. Two way crossover is hard enough to get right, let alone three way - that i'd recommend here. 2.5 way is kinda compromised more than it should since the cone of midwoofer is a waveguide for the tweeter. When used as midwoofer, cone moves +/-2mm at normal listening levels so effectively the waveguide jumps around the tweeter and that's not ideal by any standards. I'd recommend making it a three way with crossover points arround 150Hz and 2kHz. I have measurements of that concentric driver used in Q500 and a crossover at 2kHz yields very good frequency response and directivity caracteristics. Woofer should be measured for ts. 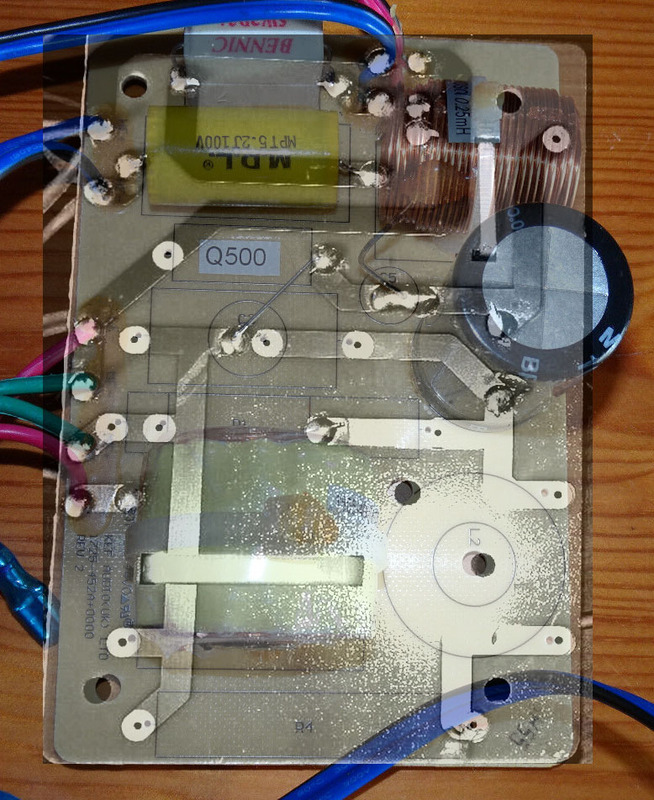 It seems to me that it has rather large Qts so they've used large capacitor in series to controll the bass bump. Then and only then, simulated response will match measured one. Last edited by Zvu; 5th April 2019 at 10:57 AM.